Blueberries are so popular nowadays, and for good reason! They are a superfood BOMB when it comes to health benefits. These tiny berries are filled with iron, calcium, zinc, magnesium, manganese, vitamin K, vitamin C, and vitamin E. They are one of the most effective natural resource of antioxidants, they containing anti-inflammatory abilities, and they are great for maintaining mental cognition. 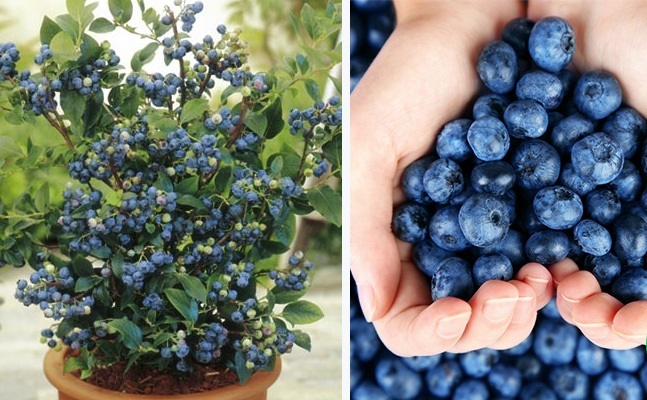 The first step to growing your own blueberry garden is to do a little research. Some blueberry bushes do better in humid climates while others can withstand the freezing temperatures. So ask around and do a little digging to find just what kind of blueberry will best suit the climate where you live. One mistake lots of gardeners make is not finding the right kind of dirt. Don’t just find a random patch of dirt and assume that it’s good. Not all soil is created equal. Check the pH level of your soil. Generally, between a 4 and 5 is ideal. If your available soil isn’t in good shape you may be better off purchasing soil and planting your berries in pots. Blueberries need lots of sunlight. If you’re planting your berries in the ground, make sure that the area you choose gets a lot of sunlight during the day. Also make sure to leave at least 5 feet between each bush. If you are planting in pots, choose a pot that’s 18 inches, and again make sure to place them in an area with plenty of sunlight. Your bushes should need about 1 to 2 inches of water per week. You’ll need to keep your bushes safe from bugs, birds, and any other hungry creatures. You can do this by putting a frame of bamboo sticks around the plant and covering with a food-grade net. This way nothing can get at your precious berries but you! 5. Keep Up The Good Work! Blueberry bushes can produce fruit for up to 20 years or so. To ensure that they last this long, be sure to give your blueberry bushes a good pruning every few years. Keep in mind that your bush most likely won’t produce berries the year that you prune it, so it’s best to have more than one bush and alternate pruning years so you aren’t left completely berry-less. Your blueberry buds will generally start popping out in the early spring, and should be ready to pick by July. After they turn that beautiful shade of blue, don’t pick them right away! Wait a few days while they reach the perfect level of ripeness. Once they are ripe the berries will fall right off the bush into your hands. Don’t let the price of blueberries keep you from their powerful benefits! Use these simple tips to start your own blueberry garden, and you may even end up with more blueberries than you could ever ask for!